A rock art site in Baja California. Baja California was the location for an early GCI field project in which the planning methodology, community involvement, and conservation approaches advocated in the Institute’s early rock art training courses were put into practice. Photo: Guillermo Aldana, for the GCI. Conservation of archaeological sites has been central to the mission of the Getty Conservation Institute since its founding. The reasons are worth recalling: archaeological sites are repositories of information and knowledge about how humankind has lived, suffered, worshipped, created, destroyed, survived, and died. They are humanity’s collective memory, comprising physical evidence of our journey on the planet, from the bones and tools of our earliest ancestors millions of years ago to the ruins and artifacts of more recent history. But they are fragile remnants of past lives, subject to decay and destruction, often barely surviving into our modern era of wholesale destruction. In the competition for space and resources, archaeological heritage is frequently the loser. The Institute’s first forays into conservation field projects—the Nineteenth Dynasty Tomb of Nefertari at Luxor (initiated in 1986 with the Egyptian Antiquities Organization, now the Ministry of State for Antiquities) and the Roman Orpheus Mosaic in Paphos (begun in 1988 with the Cyprus Department of Antiquities)—were at significant archaeological sites. Although in different countries and from very different time periods, these projects had much in common and exemplified the GCI’s early philosophy and approach to conservation. Both focused on decorative architectural surfaces (wall paintings and mosaics, respectively) privileging artistic values; neither looked much beyond the specific “object of beauty” being conserved. In the thirty years since then, major developments have occurred in the understanding and practice of conservation, both within the GCI and in the field generally. This changing nature of conservation may be characterized as movement toward a more holistic, methodological, and values-based approach that recognizes the fundamental role of good site management and the involvement of stakeholders in making conservation effective and sustainable. The gradual pivot to a more holistic approach that recognizes the context and complexity of conserving archaeological sites represented a conceptual shift that began in the late 1980s, influenced by developments in Australia at the time. It was manifested in the GCI’s Rock Art Site Protection and Management training courses, beginning in 1989, and in the yearlong professional diploma course on rock art jointly established with the University of Canberra in Australia. These early courses, although focused on rock art, were readily adapted to other types of archaeological sites and contained the hallmarks of subsequent courses and field projects—specifically, values-based planning with its emphasis on significance assessment and the importance of understanding the management context in making decisions for a site’s future. The first adaptations were aimed at archaeological sites with mosaics in the Mediterranean region, in Paphos in 1990 and 1993, and at grotto sites in China, in conjunction with the nascent field projects begun there in 1989. These three-to-four-week capacity-building courses directed at midcareer professionals (mainly archaeologists, architects, and conservators responsible for conserving and managing sites) have been a mainstay of GCI training, offered separately or in conjunction with field projects, but other models have also been developed. A more broadly based initiative for earthen sites was part of the Terra project (1998–2005), undertaken in collaboration with ICCROM (International Centre for the Study of the Preservation and Restoration of Cultural Property) and CRATerre (International Centre for Earth Construction), in which management planning was disseminated through a training course, developed at the site level (at Chan Chan, Peru) and integrated into a university curriculum. The model has been further developed through the MOSAIKON initiative. Based on GCI experience in Tunisia, where future site directors received an initial training course in conservation and management planning (in collaboration with the Institut National du Patrimoine), this national effort expanded in 2010 to a regional activity involving young professionals from primarily Arabic-speaking countries across the southern and eastern Mediterranean. In collaboration with ICCROM, ICCM (International Committee for the Conservation of Mosaics), and the Getty Foundation, MOSAIKON courses have emphasized mentored learning over a yearlong period, recognizing that for short courses to have long-term impact, participants must apply their knowledge at their own sites. The initiative addresses not only site managers, but also conservation practitioners, in particular technicians, since effective, sustainable site conservation requires skilled personnel at all levels. The GCI has worked to put theory and methodology into practice to provide models for comprehensive planning for conservation and management of archaeological sites. The more ambitious field projects have pursued the holistic approach to archaeological site conservation that first emerged in GCI training courses, and most have incorporated elements of training or have had a didactic purpose. In China, where we have sustained our longest collaboration, conservation and management activities have been implemented at various levels. Most influential has been working with partners at the national level (the State Administration of Cultural Heritage and China ICOMOS) to develop the Principles for the Conservation of Heritage Sites in China, disseminated in 2000. These were applied at the site level to comprehensive master planning at the Mogao Grottoes and through an emphasis on methodology, analysis, and testing in the Cave 85 project, which aimed to conserve and present one of the most important painted grottoes at the site, while serving as a model for similar sites in the region. 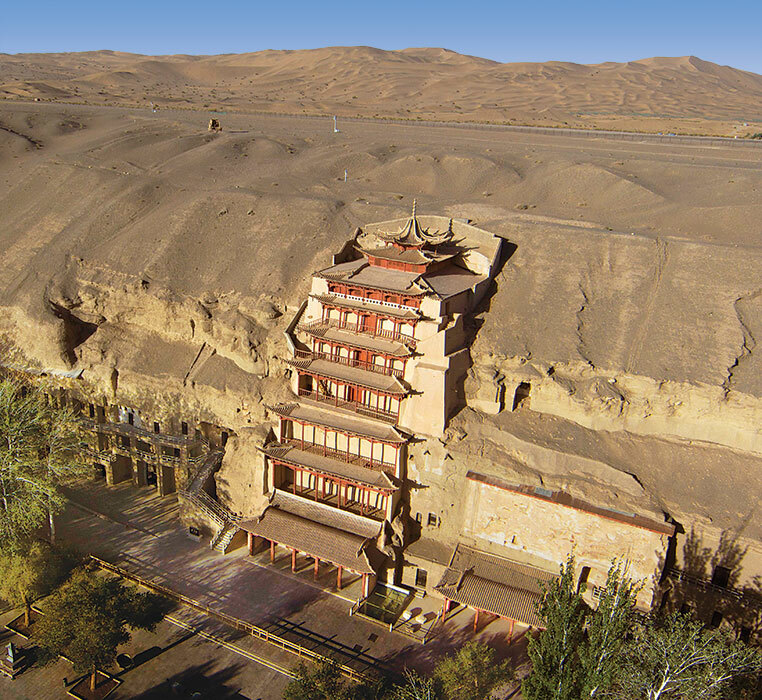 The Mogao Grottoes in China, where the GCI, in partnership with the Dunhuang Academy, has developed and applied a master planning process, conservation methodologies, and visitor management strategies and has convened international workshops and conferences related to conservation and management of sites. Photo: Wu Jian, the Dunhuang Academy. 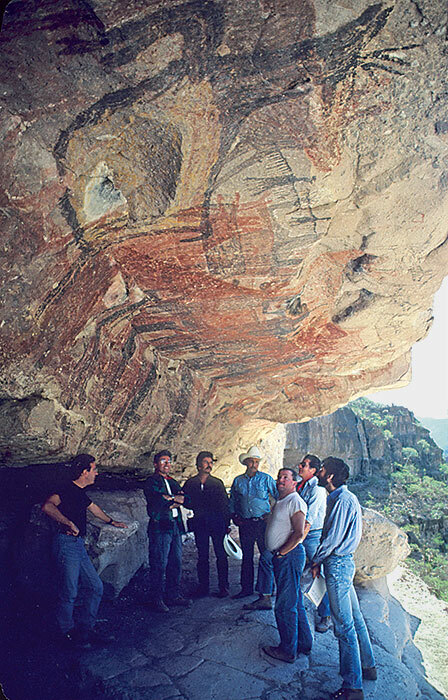 Following closely upon training initiatives, the GCI’s first rock art field project—conducted with the Instituto Nacional de Antropología e Historia in the Sierra de San Francisco in Baja California, Mexico, in the 1990s—made development of a management plan a central aim. More recently, site management workshops have taken place in southern Africa and Australia as part of the GCI’s Southern African Rock Art Project, where community involvement and indigenous management have been emphasized. The development of a management plan with the Consejo Nacional para la Cultura y el Arte (Concultura) for the archaeological site of Joya de Cerén in El Salvador (1999–2002) took the values-driven and participatory site management process much further in the direction of stakeholder participation to address complex social conditions related to the site’s conservation. The comprehensive conservation and management planning undertaken for the Valley of the Queens in Egypt exemplifies how the GCI’s approach has broadened to encompass the whole valley in which the Tomb of Nefertari resides, with equal emphasis on conservation and management. As an early adopter and adapter of values-based planning, the GCI brought its own perspective to this process, enhancing the role of condition assessment and understanding deterioration processes in decision making. This stems from our conviction that fundamental values reside in the materiality and authenticity of archaeological sites. This approach has informed both training and field projects. 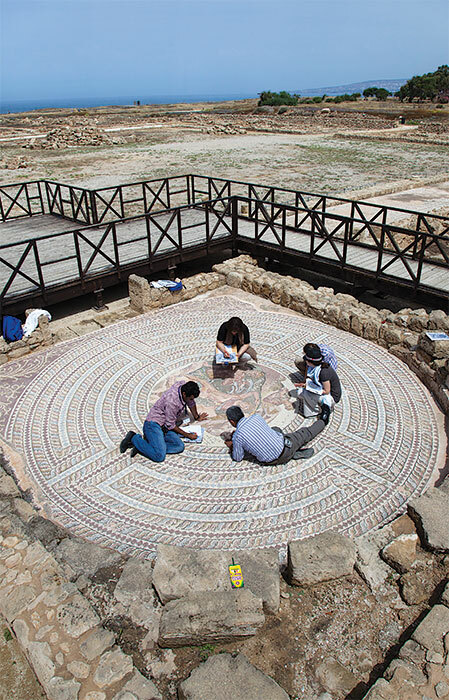 The emphasis on condition as an important criterion in decision making is currently exemplified in the MOSAIKON field project at the site of Bulla Regia in Tunisia. Here, planning is based on a survey of almost four hundred mosaics that assessed their condition, significance, and degree of exposure, while weighting condition over the other two. The resulting conservation priority rating for each mosaic facilitates the decision-making process and the development of a program of prioritized conservation actions, including preventive measures such as reburial and sheltering. The GCI’s impact on the practice of reburial has been especially significant and multifaceted. Reburial is a crucial management tool to slow deterioration and reduce the need for remedial treatments and maintenance. Since the 1990s, reburial as a technical intervention and site management tool has been disseminated through GCI training courses and publications and in field projects incorporating extensive investigation, testing, and implementation undertaken at the Hominid Trackway at Laetoli, Tanzania, at Chaco Canyon and Fort Selden in New Mexico, and at mosaic sites in Tunisia and Israel. Complementing professional courses and field projects have been numerous research initiatives (both theoretical and practical), conferences, workshops, and symposia. Given the importance of values-based planning for both training and field projects, the need for research to explore values further was seen as critical, especially as new values of heritage sites were emerging as important to society. To this end the GCI initiated the Agora project, a major research initiative in the late 1990s to explore the many values and benefits of cultural heritage conservation, including new ways of looking at economic value. This was seminal research for the profession and was important for instilling a deeper understanding of values-based planning in our practice. Over three decades, the GCI has convened many international conferences and workshops to bring professionals from different disciplines together, discuss problems, and disseminate new ideas. Some have targeted resource types, such as the international mosaic conservation conferences the GCI has organized or supported, and the Silk Road conferences in China that focused on grotto sites; others were aimed at specific conservation interventions, such as the colloquia on shelters and reburial, published in special issues of the journal Conservation and Management of Archaeological Sites, an important resource for the field begun in 1995. Convening events have also sought greater convergence of the objectives and motivations of conservation and archaeology. Such were the aims of the ambitious 1995 Mediterranean conference with venues in four countries, the Corinth workshop in 2000, and the conservation theme organized at the Fifth World Archaeological Congress in 2003. The publications emerging from these and other conferences, as well as research, bibliographies, and literature reviews on conservation and management of archaeological sites, are one of the Institute’s most important legacies to the field. The Roman site of Paphos in Cyprus, location in 2014 of the start of a course on management of archaeological sites with in situ mosaics, part of the MOSAIKON initiative. The Paphos site has been a venue for both mosaic conservation field projects and archaeological site conservation and management training courses since the beginning of the GCI. Photo: Scott S. Warren, for the GCI. Adapting approaches to conservation and management created in Western economies to different contexts is not straightforward and can be fraught with difficulties. In looking for ways to better direct our efforts in non-Western environments, we periodically evaluate our projects. Several years ago an internal GCI review of management planning activities confirmed the validity of values-based decision making based on knowledge and practice. It also brought forth the greater viability of the process in English-speaking participatory democracies, where the language and the methodology of site management planning were developed. Nevertheless, it has also been our experience that iteration and practice enhance acceptance. Site management requires not just a plan, but also the resources and institutional infrastructure to implement it. Insufficient resources and dysfunctional institutions around the world pose severe challenges to making progress in how archaeological sites are managed for their future preservation. Good governance, legislative frameworks, and policies for heritage conservation are key elements for successful plan implementation, but in many places the lack, inadequacy, or inefficacy of legal instruments and cultural policies has hindered the application of systematic approaches and the implementation of plans. These circumstances take significant time to change and entail sustained presence at sites for effective results. As the understanding of cultural heritage broadens and deepens, so do the challenges of preserving it materially and in a way that is meaningful and beneficial for society. Civil wars, looting, lack of stability, development driven by urbanization and tourism, climate change, and the impact of large numbers of visitors on heritage sites have emerged in recent decades as global threats. Addressing these urgent problems is the new frontier of managing archaeological sites worldwide in the twenty-first century. There is a continuing need to train individuals responsible for archaeological sites and to provide site managers with tools to protect their archaeological heritage. This was the impetus for the development, through the Arches Project (a GCI collaboration with World Monuments Fund), of an open source, web- and geospatially based information system to inventory and manage sites, initially developed in 2004 to assist postwar Iraq. The GCI has also begun focusing on the tourism challenge through a comprehensive visitor management program and several international workshops undertaken with partners at the Mogao Grottoes in China, as well as in its planning for the Valley of the Queens project. Over the last thirty years, both the threats to archaeological heritage and the values that society confers on this heritage have evolved significantly, requiring different models and modalities. The GCI’s ability to address the changing nature of the field through an integrated aggregate of activities—research, training, field testing and model field projects, developing methodologies and policies, convening workshops and conferences, and publishing widely—may be its greatest strength. Martha Demas and Thomas Roby are GCI senior project specialists.